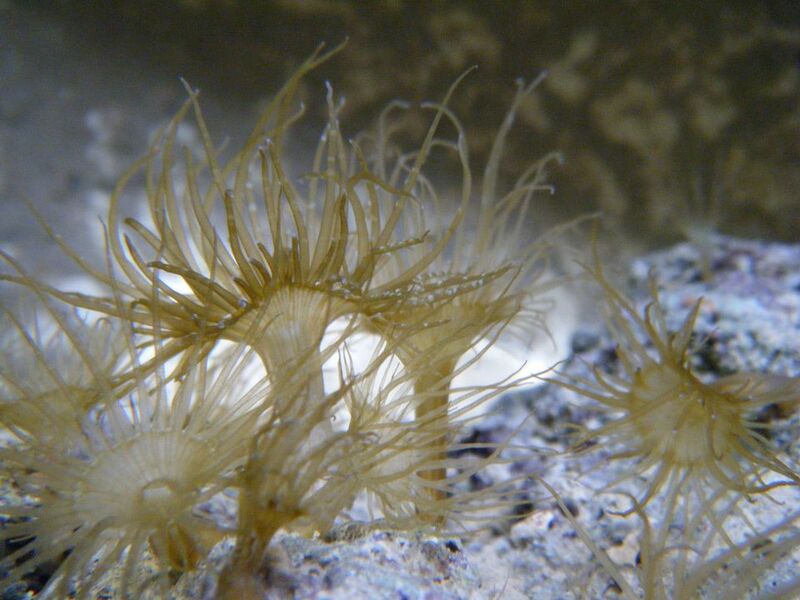 Aiptasia, or Tube, Glass, Rock Anemones are thought by many saltwater aquarium hobbyists to be a beautiful addition to their reef tank when they unexpectedly begin to sprout out of live rock. However, this attitude generally changes once the aptaisia go into their reproductive mode and take over the entire tank. As discussed in our "How To Get Rid of Aiptasia Anemones" methods article, there are a number of natural predators that can be introduced into an aquarium to consume the aiptasia in order to stem the tide. The bad news is that once the aiptasia are gone, some of these animals will consume the stuff you wanted left intact such as zoanthids, coral polyps, and a myriad of the other marine life that make a reef tank so fascinating. As far as injecting caustic solutions or using over the counter treatments, to a true naturalist the thought of adding chemicals to a reef tank is out of the question. The good news is that after some experimentation we discovered a simple, non-intrusive (except for the aiptasia) way to quickly get rid of an unwanted aiptasia anemone population in a reef tank. Inject them with lemon juice! This procedure requires only 2 items and a few minutes of your time. You'll no doubt be just as surprised as we were at how fast, effective, and safe this removal method is. 1 Bottle or squeeze dispenser of Lemon Juice From Concentrate. One 3ml Latex Free Syringe with a 0.5mm x 16mm needle. Your local pharmacist can provide you with the syringe and needle for about a half a dollar. Don't be surprised if your pharmacist asks you a few questions as to what you plan to use the syringe/needle for. Remove the syringe and attached needle from the wrapper. Twist the needle cover to tighten on the syringe. Remove the needle cover. Shake the bottle (or dispenser) of lemon juice. Fill the syringe with 3ml lemon juice by inserting the needle into the lemon juice and pulling back on the syringe plunger. Insert the needle into (not through) the base (not the top) of the anemone. Inject about .5ml of the lemon juice into the anemone. Withdraw the needle and proceed to the next one. When you are finished, disassemble the syringe/needle, rinse in clean freshwater, dry, reassemble and store for future use. As with any sharp instrument, use caution when handling it and keep it out of the reach of children. When you insert the needle into the anemone, it will normally withdraw, making the lemon juice still quite concentrated in the anemone tube. It is not unusual to see a white puff or string of white material emit from the anemone when you inject the juice. A steady hand is needed to insert the needle into the anemone tube. The smaller the anemone, the more difficult the task. You may want to let the smaller anemones grow to a size which makes the task easier. The small amount of lemon juice being used shouldn't affect the pH of your tank water, and if you have a fair amount of current in your tank the localized increased pH should disperse rapidly and have no affect on surrounding reef life. Ironically, when the lemon juice is injected into the anemone tube, the critter will close up and shrink, temporarily sealing the juice inside the tube. If you have a very large population of aiptasia present, as a precautionary measure to prevent any possible pH imbalance from lemon juice overload, it is best NOT to treat them all at one time. Choose a small section of the tank to do first, wait several days to be sure all is well with the aquarium water quality, then move on and treat the next section.